Among the financial-related VC companies in Japan, SIP as an independent VC company specializes in business strategies and has hands-on capabilities. We are one of a few hands-on venture capitals of an American Silicon Valley style. Our policy is to invent in venture companies in the early stage. 1. Atsushi Saito, who is a founder, chairman in SIP, established JAFCO, Japan Asia Investment Co., Ltd. and CSK Venture Capital Co., Ltd. . He also made a history of Japanese style VC company. With support from Mr. Saitoh, Akira Shirakawa and Kazutaka Fujiwara, who have rich experiences in the Japanese VC business field, participate in managing business in SIP that proclaims the globally standardized hands-on capital in order to accomplish another achievement in the VC field in Japan. 2. Shigeki Saitoh，CEO, son of Atsushi Saito, has worked for a major corporate in Japan and an American internet company. As an entrepreneur, he has experienced in an IPO in the internet business field and has been working in the VC business field. He also has profound business knowledge and business networks in broad business communities. SIP is a VC company, which can share entrepreneurship with company-heads in investment corporate, which is different from traditional Japanese financial VC. Toshihiro Nakada, director, is a medical doctor and has been investing in bio VC in the US. Our management members have great experiences in front line business development in various fields. 3. SIP board members are very diversified. Internationally. It includes Davy LAU, Chinese Singaporean venture capitalist living in Singapore who studied at Japanese college and graduate school, and broad and strong human resource network in all Asia region because of his career as a partner of executive research firm. Another guy is American who have lived in Japan for 25 years James KELLY with Asian specialist in the US investment banking / venture capital and Intellectual property investment spaces. There two executives support SIP to build up cross boarder business through their own native business networking. 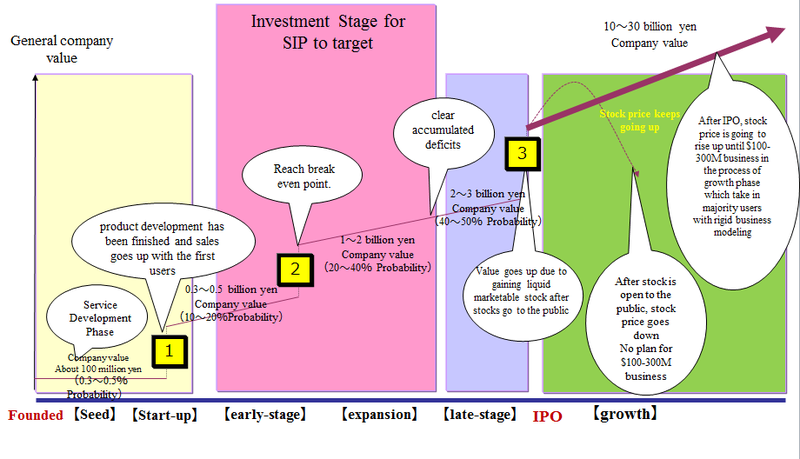 The factors for successful investment in companies in the early stage are; (1) technology・business model evaluation (2)affiliated with major companies and hands-on support (3) offering milestone investment support SIP is sufficient in (1) wise selection for portfolio company, (2)hands-on support (3) continuous support for financing by its milestone investment and through VC network coordination on financing. 1. Seed Phase: Products and services have been developed and created based on the elementally technology. 2. Early Stage Phase: Products and services are on the business circulation. As the product label is maintained in up scale, companies develop into the black. 3. Later Stage Phase: Companies offer stocks to the public and improve a situation which the stocks are liquid marketable. 4. Release Phase: Public-issued venture companies try to restructure by doing M&A in order to higher stock price. In the seed phase, most venture companies are in the process of developing their product. Furthermore, it is not clear that what level a product would reach and how large the final target market would be. In this case, the success percentage might be 3-5 % out of 100, which is high risk. In this stage, it is crucial for a company head to be professional in developing products. However, it is not usually the case that he/she is an expert in sales, marketing, or establishing business partnership with major companies in later stages. Therefore, a quality of entrepreneur could be a main risk. On the other hand, in the later stage, the companies have turned into the black and became highly stable in terms of business management, compared to the companies in the seed or early stage. However, it is not promised to gain high return due to stock evaluations. Furthermore, it is difficult to gain high ROI as the stock investments in venture companies. The venture companies in the early stage have already developed their product. However, the companies are still losing money due to a lack of customers, even though a group of the first users use the product. SIP selects the venture companies in the early stage, which provide innovative products. Then, we support those selected venture companies to make business partnerships with major companies with appropriate sales channel in the suitable product field. We will also urge business partners to support the invested company strongly to produce emerging growth. In addition, it is possible to avoid downside risks, which are caused by support from business partners and M&A, when growth disincentive has occurred. SIP made investment risk hedge strategic by way of organizing a systematic strategy. Such strategies are a product sales take-off and partnership with a major corporate in terms of emerging growth, which is over the selling, general, and administrative expenses. We consider the strategies which lead to a big success in order to aim a higher performance fund operation. 1. Investment in start-up companies. Our main targeting companies are those companies in the early stage. However, when we discover a company in the stat-up stage, which is excellent in Merkmal within 5% in total, we consider this company an investment target and encourage them to accomplish higher results. 2. Creating business model with high PER Qualities of a venture company are determined not only by a marketable products, but also by product price, which leads to a high ROI company. Regarding to the hand-on training in investing companies, we actively introduce the system that customers (users) pay monthly, rather than customers make only one time payment, just like service or hardware selling. We support investing companies toward high ROI companies, while we offer price which the base of customers directly connects to the revenue base. 3. Instructions on Capital composition here are two types of venture companies after their stocks are offered to the public. One is that the stock price goes down. Another is that the stock price goes up. We believe that those two types were resulted from whether or not a venture company maintains the business model with high ROI, which is explained in (2); moreover, whether or not stock holders keep their expectation that the stock price keeps going up. When Angel investment ratio is high, the initial stock holders sell out the stock, which causes to lower the the stock price. This situation could happen because a group of SmallCap investors is weak in Japan. SIP establishes good partnerships with VC which is related to life insurance companies with an expanding strategy of hidden property. We finance the life insurance related VC during fund raising for investing venture companies in the later stage. Then, we propose a capital policy, which encourages stock holders to retain stocks after the stock goes in public. In addition, when the stock price in the investment company keeps going up, we try to achieve the biggest capital gain by way of holding stocks while we finance. A product of venture stage is called a core product. It is usually accepted to a group of innovators. 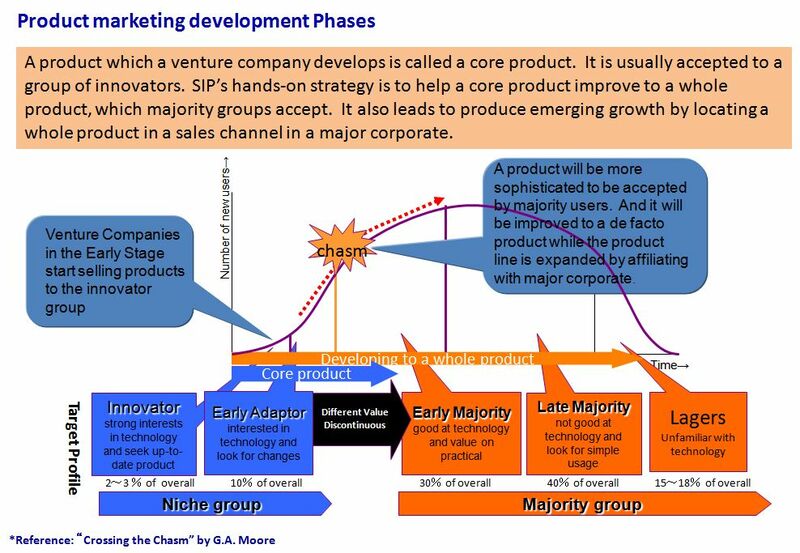 SIP’s hands-on strategy is to help a core product improve to a whole product, which majority groups accept. It also leads to produce emerging growth by locating a whole product in a sales channel in a major corporate. SIP has profound relationships with business lines of major corporate in various business fields, which our key-men established with their rich business experiences. It is not easy for venture companies to have networks to sale products to major corporate. SIP introduces venture companies to major corporate of targeting business line. In this way, we are able to provide quality of support from an executive level. As a market growth ratio in variety of business fields is going slow in Japan, the overseas market, which specializes in a certain type of product, becomes crucial to an emerging growth. SIP’s hands-on strategy supports to develop not only in the Japanese market, but also in the European market and growing Chinese market. The MIT Enterprise Forum of Japan engages in incubation supportive activities in Japan. Center of the members are MIT & Stanford graduates and active venture incubators, who promote the MIT’s Technology Seed Incubation Method. The MIT Enterprise Forum of Japan has held the Business Plan Contest for eight times. Since 2008, this contest has been organized by collaboration of Venture Enterprise Center, which is the incubation sector in Ministry of Economic, Trade and Industry Policy Bureau, and The MIT Enterprise Forum of Japan. In 2009, NPO Venture Support mechanism TSUNAMI, which is NPO incubation organization, will host The Business Plan Contest in Japan together.